As I studied this, I realized that I do have so much fear on the road that I am traveling. And my fear is not about not going. I am going. I know that. It’s not a matter of inaction. Here am I, Lord send me!!! Whoohoooooo! No, my fear is based soley upon this: what if I succeed? Then what? Well, duh! Do I honestly think that God would not equip me with the tools and things necessary for success and beyond when it is His success through me? Hmmm…I had to think and start digging deep. Someone paid me the highest compliment ever yesterday. I was told that although I type about 90 words per minute, my mind must think at 250 words per second. (Thanks, Jon!) I believe it is because I sense so much urgency in relaying information and teaching that my mind is able to work that fast! That actually turned something I felt was a negative into a positive! So now I’m sure my mind is thinking about 500 words per second. Nehemiah set me on fire! The old quote I’ve heard many times is this: The only time we can fail is if we never try. But tonight I wonder, is it really? Is it possible to fail by succeeding? And which paralyzes us? Are we more paralyzed by the fear of success than the fear of failure? Which actually keeps us from acting? The fear of failure or the fear of success? Succeeding doesn’t necessarily mean we’re home-free! Success doesn’t mean that we’re free and clear and the job is done. I believe in my case it is the EXACT opposite! Success in life management, teaching to changing lives, raising money to build shelters in communities and provide people’s most basic needs in the name of Jesus, and rebuilding what has been broken in our homes and towns through proper management of resources and priorities, means that the work has actually just begun! HELP ME! LOL!!! I’m a leader who just might harbor a little too much passion! I’m also a leader who’s scared out of my witts! But I am equally as excited! If this succeeds, the work has just begun. The blueprints, materials, and building of the facility was just the beginning. It’s what occurs once the completion of the walls is done that counts. So now I contemplate what failure really is. As I study Nehemiah, I learn that God is reaching me not only to teach me about failure, but about trust. And He is teaching me by the book. His holy and unfaulted book. The Bible. This is my six month old cat, Chunks. BIG KITTY! 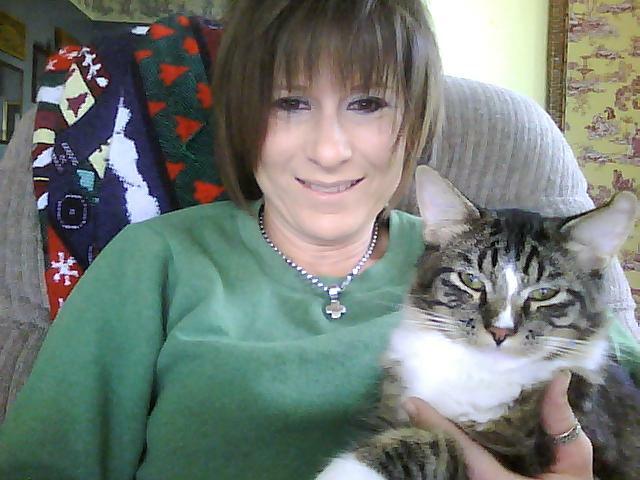 He is usually laying across my wrists as I type and work on the life management magazine and my blog. He makes a nice coworker, lol. The only draw back? His nasty wet mouse. He shares what he loves with me, but I guess that’s a good thing. Have an awesome, Monday. Blessings to all! PS. Don’t overlook your blessings 😉 Even that nasty, wet, toy mouse is a blessing. Why? If I didn’t have that to deal with, I wouldn’t have my cat. Be grateful for what the Lord blesses you with! Every once in awhile I receive a friend request on Facebook from a person that I do not know well or at all (a friend of a friend of a friend). And I sometimes also know that they are not a Christ follower. I am particular about who I follow on the social networking scene such as Facebook and Twitter. I pick and choose who I associate with carefully. However, I am not so sure that I should be so careful of those who follow me. Even through social media there is the possibility that my status updates and profile posts could help a non-believer learn about Christ. It just might be that someone following my posts and updates would be able to sense how the Lord is working in my life. It is a very real possibility that my updates could serve as a starting point for an individual. So if my posts could possibly plant seeds to an unbeliever or a person who has fallen away from Christ, why not friend them? After all, I can control what I see in return by filtering what gets through to me on my home feeds. Since I have this technology available to protect what I see, shouldn’t I friend someone who is requesting my online friendship when I am giving glory and trying to honor God with how I live so it can be shared with someone else? If just one of my updates or tweets would get someone to start thinking about God, wonder about the life of Jesus, or wonder what it is like to live as a believer by seeing what goes on in my own life (up close and personal-not superficially), then it is worth it to me to friend them. I hope that as I use social media I am using it to bring glory to God. I hope I use it to evangelize. I hope to use it for missions work when I can’t be out reaching the entire world. I hope to use it to show others that God is real, that God does love us, and that salvation through Christ is available. I hope to use it to teach and reach! One person at a time, one friend request at a time, I have the opportunity to talk about faith with people I couldn’t reach otherwise. And they don’t even realize I am talking to them about Christianity through updating my status’ and sending tweets about how I am living through my own life. How cool is that?! Christians can now fly under the “I’m going to tell you about Jesus” radar that makes most non-believers run. Instead, I can tell them by what I DO and SAY in my own life. Now, I’m going to tweet this! Recently I was at the Kansas Nebraska Southern Baptist Convention. I really enjoyed being there, and since it was my first time attending, I found myself learning quite a bit. Learning is a favorite past-time for me depending upon the subject, and this was stuff I was just soaking in. I wanted to leave with as much absorbed as possible. Soon though, it was time for prayer and the pastor’s who would be our speakers. 1 Therefore, since we are surrounded by such a huge crowd of witnesses to the life of faith, let us strip off every weight that slows us down, especially the sin that so easily trips us up. And let us run with endurance the race God has set before us.2 We do this by keeping our eyes on Jesus, the champion who initiates and perfects our faith. * Because of the joy* awaiting him, he endured the cross, disregarding its shame. Now he is seated in the place of honor beside God’s throne. Dude…I am a runner. I cannot possibly contain this passion and sense of urgency to teach what I teach. Why? Because it is Christ-centered. Life is so CRAZY, hectic, and everything in our society has become urgent and competes with what God has called each and every one of us to do. Sometimes we think we will run our race tomorrow. Some of us are still stand at the starting line, afraid to actually run. Some of us are waiting for someone else to go first, so if it’s a false start or someone doesn’t like the track we are on, we can point a finger and blame them. There are so many reasons why running the race with urgency and endurance is put off. But the #1 reason for it is with this “too busy to breath” mentality, and the promotion by our society of business in lieu of effectiveness. Because of these we consistently fail to keep our eyes fixed upon Christ. Life Management is about being Christ-centered, understanding our priorities and their importance to each and every individual person, and running the race based on that. So, as I sat and listened to our speakers, I became excited. How can one not be over the top, excited, and wanting to live their purpose with such a passion when it IS urgent to run this race? How can one not want to jump out of their seat and keep enduring to win the race, when they are focused on Christ who is at the finish line? Who is the chic that looks like she has ADHD every time she hears, speaks, works, writes, creates, and yes-even listens to others who are just as passionate? You guessed it. I’m the woman in the pew who looks at her friends and lifts herself up off the pew as if she’s going to start running any second. I’m the woman who shakes her foot non-stop as she thinks of 9 billion blog topics, workbooks, and ways to help people change their lives as I listen. I talk under my breath, my eyes fill up with tears when I feel so much urgency and passion that I could literally explode. I’m this crazy person who knows deep down that she can’t stop running even though there are millions of miles left ahead. And I don’t even care to ask how many miles are left or where they are located. Will it be dangerous? Will it be scary? Will there be rest along the way? It just doesn’t matter. The only thing that matters is that I listen, go, and do what I have been called to do. So I thought for the comfort and safety of those around me, that a seat belt to hold me in my chair in church, in a conference, in a meeting, or when I’m working, just might be appropriate. You know, so not IF, but WHEN I jump up out of my chair, to run off and get yet another day of work done for the Lord, I don’t trip over the people around me or scare them. But then again, why would I want to do that especially when I can show those around me that running this difficult and challenging race is the most awesome thing I could do in my life. Forget the seat belts. Jump out of those seats. Put on the full armor of God and you an run the race, endure the race, and finish the race. And if you’re looking for safety and security, I may not be the best person for people to sit next to. You’ll have to endure my excitability! This IS the EXCITING RACE!!! Is Social Media A Leader’s Popularity Contest? I absolutely love being on Facebook and Twitter. It’s fun, it’s a creative outlet for me, and it’s just one more place that I can spread some of my (over-abundance of) energy out. My mind seems to work overtime, my thoughts travel around my brain like it’s NASCAR, and most of them do collide before they ever hit my blog or other social media outlet. But, as a leader in life management, I began to wonder about how social media plays into leadership. I know for myself that receiving input is on most days a good thing. I like to see that people understand what it is I am writing about, tweeting, or commenting on. It produces a sense of validation, correctness, and likability. But what happens when leaders become focused on responses to social media? Does no response equal a disliked thought process? Does the fact that no one has “liked” your status updates on Facebook equal dislike? Leaders who do not settle for the status quo or brown-nose models for acceptability for what has been the norm may not receive squat in the form of social media feedback. But lack of feedback doesn’t necessarily mean anything. Consider Twitter’s Follow Fridays where users are given props in a #FF (Follow Friday). He who has the most is the biggest leader. The most popular. The most successful. Seriously? Is that really what it means? Social media has become a popularity contest? Yep. All of the sudden in some aspects (but not all), social media has become a popularity contest. Does a small following mean that we are not needed? Does it mean that individuals are failing as a leader if response rates are slow or low? Will leaders start basing every move they make on social networking likability? As leaders are we going to base everything we lead, do , or say on the number of re-tweets we receive? As leaders are we consulting our social media outlets more than we are consulting God and His will, word, and direction? I know I have seen myself slide into this. And it’s so easy. At times I find the best way to control the leader in me who seeks to follow what social media finds popular, I must unplug from time to time. Social media is not a replacement for seeking God. Nor is it an accurate measurement of how well we are doing by the number of followers, likes, or dislikes we have. If we as leaders do not stay focused upon God and our missions, we will become focused on our own popularity. And when leaders become focused on themselves, they can’t lead others effectively no matter what social media says. I was thinking today about a conversation with peers I’d had earlier this week about accountability, growth, and leadership. And of course, at various times since then, different thought patterns have started. Effective leadership instills, teaches, and promotes accountability. Accountability promotes, teaches, and instills effective leadership qualities. Growth happens when people are accountable. Growth happens when individuals are leading. But there was something else missing from growth. I thought about my kids. How have they grown? Well, for one they are out of diapers and into designer jeans. Yeah, except that the diapers were easier to shop for. Another bonus is that they are past baby food stage and into the teenage “eat everything in sight after school” phase. This was still not what I was trying to pull from my thoughts on growth. So, I decided to grab a snack, although I wanted something low-fat. I didn’t want to have to exercise any more than necessary! As soon as I thought about exercise, I realized that this was exactly what I was looking for. In order to grow, we must exercise. We can’t get bigger biceps without exercising. We can’t gain more muscle unless we exercise. We can’t increase our strength, gain power, and hold on to what we have unless we challenge the muscle we have already and grow it. Growth to get bigger, gain more, and to add in quantity requires exercise. Exercise requires action. Actions require a plan. And plans are made to reach a goal. Everyone wants to exercise, because it sounds like a good thing to do. It looks good. I’m supposed to do it. But honestly, who is going to STICK with an exercise program if they don’t know what their goal is? And why would anyone have a goal if it didn’t mean something personal to them? We see this every holiday season. People purchase gym memberships and millions of dollars worth of exercise equipment that they plan on using. Without a specific goal, they are essentially volunteering their body’s to participate on this vision in their minds. Without ownership, without a specific and measurable goal in sight, and without ever taking the time to determine the importance of this activity in their life, why would they continue on this vision? They don’t. And I believe that is the same reason we lose volunteers. People start and stop. Start and stop. Start and stop. The growth they were hoping for doesn’t happen and discouragement sets in. Pretty soon, they don’t even show up. The solution is for growth to occur steadily, continually, and with a clearly defined path specific to each persons goals and life area mission statements. That creates personal accountability and meaning-even in volunteering. It creates a growth chart of sorts. Out of growth great leaders are born and raised. These up and coming leaders and maturing individuals will require good coaching and leadership to keep them on their growth course. And we all like to see how much we’ve grown in our life areas. Growth attached to exercise, exercise attached to involvement, and involvement attached to personal accountability is when growth becomes sustainable. And only when growth is sustainable does it become measurable. This is just one of my thought processes which may turn out to make sense only to myself until I dive a little deeper into it. No harm in that, but comments are always appreciated.